aIndian cricket captain Virat Kohli was recently awarded with the most prestigious sporting honour, Rajiv Gandhi Khel Ratna Award, by President of India, Ram Nath Kovind. The cricketer’s soulmate, Anushka Sharma, was among the guests to add to his bliss with her presence when he was receiving the award. She was all excited and seen cheering and celebrating the moment. Just a day after, the 29-year-old took to social media to thank his beautiful wife for inspiring him to push forward and guiding him to do the right thing. He took to Instagram and not just thanked Anushka for always being by his side, but also called her, his motivation, inspiration and strength. “The person that inspires me to push forward despite all obstacles. The person that guides me to do the right thing in life against all odds. The person that has changed me inside out and made me realise the power of true love. My strength. My soulmate.”, he wrote along with a picture of Anushka. Virat Kohli and Anushka Sharma have always been considered a power couple by everyone. But more importantly, the way the two behave around each other is the one thing that makes us adore these lovebirds. 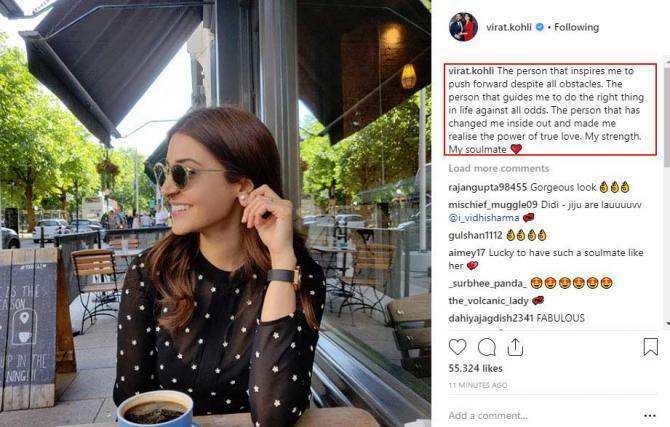 While Anushka Sharma has already said that Virat is “the greatest man in the world”, now the cricketer’s compliment for her is definitely giving us #couplegoals! On work front, Virat and Anushka were recently seen shooting for an ad. Meanwhile, Anushka is also awaiting the release of her film Sui Dhaaga – Made In India alongside Varun Dhawan.